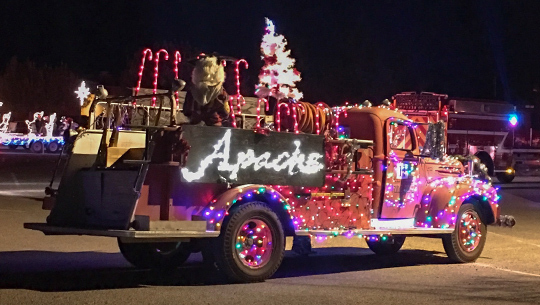 Apache has been an active, involved citizen of Cochise County and southeastern Arizona since our company was founded in 1920. Although a lot has changed during that time – both inside our walls and throughout the region – our goals and standards have never wavered. Our top priority has always been safety, and the 2015 introduction of our unique Safety Management System (SMS) program further enhances Apache's ability to protect the people and property of our community. Our Community Warning Siren is just one example of how Apache works to keep its community safe. If a vapor/gas releases or a spill occurs, a siren with a distinct up and down cycling sound alerts residents. Those within one mile should use their provided Shelter-In-Place kits and everyone who hears the siren is encouraged to listen to local radio stations for updates. Once the situation is contained, an “all clear” signal sounds, which is a flat tone that does not cycle up and down. This tells residents the potential danger has passed. Other essential, long-standing business priorities include honesty, quality products and stewardship. Apache has pledged to uphold three tenets of sustainability—People, Planet and Profitability – all of which are evident in our many community partnerships. Going the extra mile, one step at a time. Apache is committed to Cochise County, and everyone in it, because we live and work alongside each other here. What impacts one person affects us all, and that's why we put so much emphasis on safety, the environment and advancing earth-friendly practices. We're also dedicated to investing in our region and its neighborhoods. By giving back to our community through financial stewardship and personal participation, we strive to enhance the quality of life of anyone Apache touches. That's why we developed the Apache Community Advisory Council and Good Neighbor Program. It's further proof that we all rely on each other.